I am not a fan of many Pakistani dishes, but chicken bihari kababs are one of my favorites. From time to time, I turn them into rolls for the family and/or guests. For the Chicken Bihari Kababs, I took chicken breasts that were sliced into thin fillets (chicken ka pasanday in other words) and marinated it with: salt, pepper, paprika, ginger powder (or ginger paste), garlic powder (or garlic paste), red pepper flakes, grinded fried onions, grinded poppy seeds (or kashkaash), grinded raw papaya [to help tenderize the chicken], yogurt, bihari kabab masala, and oil. For the oil — I love what the mustard oil does to the bihari kabab, but I’ve made it many times over with plain old cooking oil as well. Put it on the skewers, and bake for about 35 minutes on 380 degrees. half way through making, turn the skewers so both sides cook evenly (if it won’t turn, it’s not a big deal). Next, for about six or seven minutes, put it under the broiler. marinate it at least twenty four hours beforehand so it marinates well [and the meat has time to tenderize]. Sometimes when I am making the chicken bihari kababs specifically for these rolls, I’ll use minced chicken meat. For the paratha portion, I just used a store-bought one that I heated up over the stove. For the sauces, I used a combination of two: a homemade raita and store-bought tamarind (imli) chutney. Take coriander leaves, salt, garlic, paprika and lemon juice. Run it through the processor. We do these in a large batch and freeze them. Once they are frozen, I’ll break them apart for single-sized uses so when I need some, I can just pull out one piece, and not wait on a large piece to defrost. 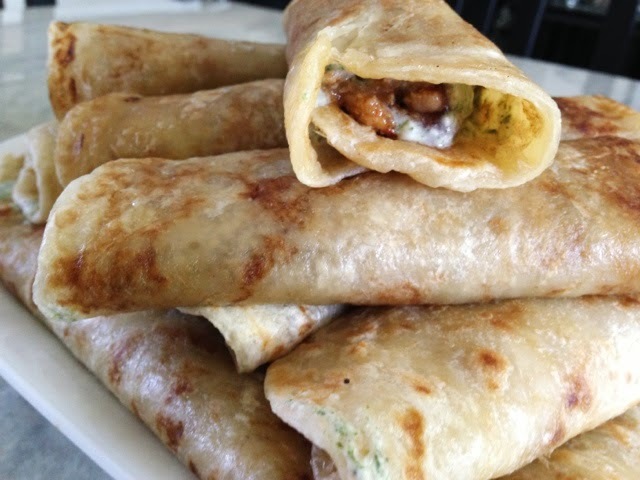 Whether you are using it fresh or after waiting for it to thaw, when you are ready to make the raita: take yogurt, salt, garlic powder and some of the coriander mixture and mix it well. The thickness will ultimately depend on your own liking, but I don’t thin it out for these types of uses.